1. Mr. Speaker, I beg to move that the House do now resolve into Committee of Supply on the Estimates of Revenue and Expenditure for the year 1st January 2012 to 31st December, 2012 presented to the National Assembly in November 2011. 2. Sir, I am the bearer of a message from His Excellency the President recommending favourable consideration of the motion that I now lay on the Table. 3. Mr. Speaker, as I begin this budget address, I wish to acknowledge the macro-economic achievements that the country has attained when the economy was under the stewardship of my predecessor, Hon. Dr. Situmbeko Musokotwane, MP. I would like to pay tribute to him and the previous administrations for laying a strong foundation upon which this Government will build. 4. Mr. Speaker, 2011 is a landmark year. In September, we held successful elections and had a peaceful transition of power, a rare feat on the African continent. As Zambians, we should be justly proud of this achievement. In October, we celebrated 47 years of independence, regrettably amidst persistently high and unacceptable poverty levels. 7. Mr. Speaker, in 2011, the global economy continued its recovery. Annual growth is projected at 4.0 percent slightly lower than the 5.1 percent recorded in 2010. Economic growth was strong in the emerging and developing economies, with growth in Sub-Saharan Africa of 5.2 percent in 2011. In contrast, growth in the advanced economies, at 1.6 percent, continued to be sluggish largely on account of unsustainable sovereign debts in some Euro zone countries and weak demand in the United States of America. 8. Mr. Speaker, strong growth in emerging economies and political unrest in North Africa and theMiddle East have kept international commodity prices high. The average price of copper in the first ten months of 2011 was US $8,704 per tonne, compared to US $7,538 per tonne in 2010. The price of oil has averaged US $109.9 per barrel in the first ten months of 2011, higher than the US $79.0 in 2010. International food prices have also been generally high in 2011 mainly on account of supply constraints. 9. Sir, high commodity prices present both opportunities and risks to the domestic economy. High copper prices can boost export earnings, facilitate investment and support the fiscal position. Similarly, high food prices present an opportunity for the country to enhance agricultural production, and diversify the export base. In contrast, high oil prices could increase the cost of production thereby increasing inflationary pressures in the domestic economy. 10. Mr. Speaker, preliminary estimates indicate that the economy will grow by 6.5 percent in 2011. This is in line with the initial projection of 6.4 percent. Agriculture, manufacturing, construction, and transport and communications are the main drivers of this growth. Growth could have been significantly higher had the mining sector performed according to projection. I am concerned that the mining sector data do not fully reflect actual production. 11. Sir, annual inflation has remained in single digits and was 8.7 percent in October, 2011 compared to 7.9 percent in December 2010. The increase in inflation reflected the slight rise in annual food inflation despite a high maize harvest. However, non-food inflation has been fairly unchanged at low double digit levels. The recent reduction in fuel prices, effected by the PF Government, should reduce inflation by the end of the year. 12. Mr. Speaker, economic activities in 2011 have continued to drive growth in money supply. The annual growth in money supply was 26.8 percent up to September 2011 compared with 23.6 percent during the corresponding period of 2010. This was mainly driven by increased lending to private enterprises, reflecting high confidence and opportunities in the economy. 13. Sir, with regard to interest rates, returns on Government securities rose mainly on account of higher Government borrowing. Interest rates on Treasury bills increased to 14.2 percent in October 2011 from 8.2 percent in December 2010. Similarly, interest rates on Government bonds edged upwards to 16.2 percent from 11.3 percent. Sir, lending rates in commercial banks have remained high and are not in line with low inflation and relative macroeconomic stability. At the current level, commercial bank interest rates are 300 percent the inflation rate. 14. Mr. Speaker, high interest rates are a serious constraint to lowering the cost of doing business, increasing access to credit and accelerating private sector growth. This is particularly true for the small and medium scale enterprises which account for the bulk of employment opportunities and growth. In addition, small and medium scale enterprises offer the most powerful weapon to reduce poverty and create a just and equitable society. 15. Sir, Government’s legitimate expectation is that interest rates will continue the downward trend that started within the first 30 days of the PF assuming Government. The Bank of Zambia has taken steps to enhance the liquidity available to banks by lowering the reserve ratios. This can only be justified with a lower interest rate regime. 16. Mr. Speaker, the financial sector’s overall performance has been favourable. In the banking sector, asset quality improved due to a reduction in gross non-performing loans. With respect to the non-bank financial institutions, performance and financial condition was rated fair as at end-September 2011. The sector has continued to record growth with the number of institutions increasing to 95 as at end-September 2011 from 87 at end-September 2010. 17. Sir, with regard to developments under the Financial Sector Development Plan, access to financial services has increased through the promotion of microfinance services, mobile banking, money transfer services, and rural banking for the financially excluded districts. The number of mobile money service providers increased to 57 as at August 2011 from 29 in December 2010. In addition, the number of districts without banking services declined to 7 as at end-September, 2011 from 14 in December 2010. 18. Mr. Speaker, in line with the positive economic performance, the Lusaka Stock Exchange is poised to register another year of impressive growth. In the first nine months, the share price index increased by 9.3 percent to 3,823.1, while market capitalization rose by 44.9 percent to K44,802.1 billion. This outturn was partly due to an improvement in net portfolio inflows of foreign capital amounting to US $13.0 million, compared to a net portfolio outflow of US $8.2 million over the same period in 2010. 19. Mr. Speaker, the external sector remained strong. The current account surplus is projected to rise by 54.7 percent to US $951.0 million in 2011 from US $614.7 million in 2010. This is mainly on account of high copper export earnings of US $8.4 billion, up from US $5.8 billion in 2010. Non-Traditional Exports are again expected to register robust growth and are projected at US $1.5 billion in 2011 from US $1.2 billion last year. Consequently, gross international reserves rose to US $2.6 billion as at end-September 2011, representing 4.3 months of import cover. 20. Sir, the exchange rate of the Kwacha against major currencies exhibited resilience. It depreciated marginally by 4.5 percent to K4,949.8 per US dollar at end-October, 2011 from K4,735.7 per dollar as at end-December 2010. This was despite uncertainties prior to the elections and the strengthening of the US dollar. 21. Mr. Speaker, the performance of the budget in 2011 has generally been satisfactory with end year revenues expected to be above target. However, there have been large pressures on expenditure arising from the need to fund the general elections, increased maize purchases and procurement of fertilizer, among others. Consequently, the overall deficit is expected to be 3.1 percent of GDP, compared to the projection of 2.9 percent. 22. Sir, preliminary figures as at end-September indicate that domestic revenues at K14,580.2 billion have over performed. This trend is expected to continue and will result in an over performance of 23.2 percent by the end of the year. This performance is mainly attributed to payment of mining tax arrears and improved tax administration. 23. Sir, general budget support receipts from cooperating partners were projected at K586.5 billion in 2011. As at end-September, K298.8 billion was received and the balance is expected to be received in full by the end of the year. 24. 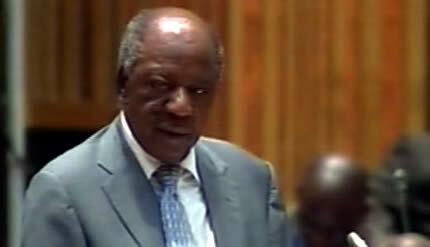 Mr. Speaker, total expenditure by the end of 2011 is expected to be K24,041.2 billion, 18.8 percent higher than budgeted. This is against the total expected revenues and grants of K20,657.1 billion. The difference will be financed through borrowing. 25. Mr. Speaker, as at end-September 2011, Government contracted external loans of US $504.8 million to finance the implementation of infrastructure projects in the roads, energy and agricultural sectors. A net amount of about US $200.0 million was disbursed on new and existing loans. Consequently, external debt rose to US $1.6 billion as at end-September, 2011 from US $1.4 billion in 2010. At this level, the external debt stock is 8.2 percent of GDP, well within sustainable levels. 26. Sir, as at end-September, 2011, total domestic debt amounted to K13,876.8 billion or 16.1 percent of GDP. Of this amount, K12,820.9 billion is accounted for by government securities while the balance of K1,055.9 billion is accounted for by other public liabilities such as pension arrears, awards and compensation, and arrears to suppliers of goods and services. 27. Mr. Speaker, macroeconomic policy under the new administration will be geared towards maintaining a stable macroeconomic environment conducive to investment, inclusive growth and employment creation. d) maintain gross international reserves of at least four months of import cover. 29. Mr Speaker, monetary policy in 2012 will remain focused on the maintenance of single-digit inflation. In line with this objective, the Bank of Zambia will continue to use market-based instruments to limit money supply growth. The Central Bank will also continue to work towards enhancing the effectiveness of the monetary policy. In this regard, the option of adopting an interest rate-based framework will be explored further. 30. Sir, a flexible exchange rate regime has worked well forZambia by absorbing external shocks that could have been harmful to trade, employment and inflation. In this regard, the Government will ensure that determination of the exchange rate remains market based while supporting the competitiveness of our exports. To minimize the impact of rapid movements in the exchange rate, the Bank of Zambia will maintain its policy of intervention to smoothen volatility. 31. Mr. Speaker, maintaining a sound financial system is essential to investment and economic growth. To this effect, the Bank of Zambia will continue to promote stability of the financial sector through strong supervision of financial institutions and by ensuring compliance with regulations. 34. Mr. Speaker, the Government is aware that even as we spend more on socio-economic infrastructure, our ability to meet our debt obligations should not be ignored. In this regard, the Government will target concessional borrowing as the first option. In order to meet the huge infrastructure financing needs, the Government will also consider non-concessional borrowing for projects with high economic and social returns. 35. Sir, this Government will ensure transparent and accountable use of loans by strengthening parliamentary oversight. Further, the capacity to appraise projects in the Ministry of Finance and other ministries implementing major projects will be strengthened. The Government will also review the existing legal framework in order to strengthen debt management. 36. Mr. Speaker, early this year,Zambia was assigned a B+ rating by two reputable international rating agencies. This has opened up the opportunity forZambia to diversify its external financing sources to support our commitment to improve infrastructure, particularly in the road and energy sectors. To this end, the Government plans to proceed with the issuance of a ten-year sovereign bond worth US $500 million in 2012. 37. Sir, the issuance of this bond will establish a pricing benchmark for future bond issuance by both the private and public sectors. Furthermore, it will enhance the visibility of the country as a favourable destination for investment. This will “crowd-in” private sector investment and ease competition for domestic savings. 38. Mr. Speaker, the PF Government recognizes the efforts of previous administrations in establishing strong growth. However, indicators of human development inZambia are dismal, with poverty remaining consistently above 60 percent. In rural areas, the situation is even worse at 77.9 percent. Unemployment levels have remained unacceptably high especially among our youths. According to the 2011 Human Development Report,Zambia is still ranked among the poorest at 164th position out of 189 countries. 39. Sir, this tells us that we must never focus exclusively on macroeconomic stability. A mother in Gwembe is not interested in lower inflation if she can’t take her child to school; an unemployed youth in Kaputa is not empowered by songs of praise about stability of the exchange rate but by being provided with skills and job opportunities; our hard working farmers across the country have no interest in real GDP growth if their farm produce lies uncollected, they are not paid on time and they do not receive a reasonable and fair recompense for their labour. 40. Mr. Speaker, to address these concerns, the PF Government will focus on social justice and equity while sustaining macroeconomic stability. This will be achieved through diversifying the economy, enhancing productivity, promoting employment opportunities and pursuing sound financial management while investing in supportive infrastructure. 41. Sir, let me now provide brief details on each of these strategies. 42. Mr. Speaker, for far too long, our economy has continued to be over reliant on copper which has delivered limited benefits for the majority of our people. This Government recognises recent efforts made towards diversifying our economy. We are determined to accelerate these efforts by promoting growth in the agriculture, tourism and manufacturing sectors. 43. Sir, in the agricultural sector, we will extend support to crops beyond maize, strengthen research and extension services, invest in irrigation, develop and rehabilitate livestock infrastructure and promote disease free zones. In addition, the Government will reform the agricultural marketing system, promote agro-processing and forward linkages including through the development of farm blocks. Other strategies will include technological transfer and land development. 44. Sir, in the tourism sector, we will promote and expand tourism products and develop key infrastructure. The Government will also open up areas for private sector investment including the northern circuit. Further, with His Excellency’s bold decision to relocate the provincial capital to Choma, Livingstone will now be able to devote all its energies to enhancing its status as the tourist capital ofZambia. 45. Mr. Speaker, in the manufacturing sector, the Government will facilitate private sector development, promote the growth of Micro Small and Medium Enterprises and develop rural based enterprises. In this regard, the Government will continue with the development of the Multi-Facility Economic Zones. 46. Sir, to enhance private sector productivity, the Government has, within 50 days of taking office, lowered the cost of credit. The Bank of Zambia will continue to engage the financial sector to ensure that innovative ways of providing affordable financing are identified and implemented. In addition, the Government will accelerate business licensing and regulatory reforms to further reduce the cost of doing business inZambia. We will also invest in vocational and technical education in order to equip the labour force with the appropriate skills that meet the demand of the private sector. 47. Mr. Speaker, Government’s ability to effectively promote pro-poor growth through the budget is dependent on the efficacy of its public financial management (PFM) practices. Consultation, transparency and accountability are cardinal principles upon which this Administration will manage public finances. Adherence to these principles will reduce the space in which misuse and abuse of public resources can thrive, thereby enhancing the development orientation and service delivery impact of public expenditure. 48. Sir, to this effect, in 2012, the Government will finalize and begin to implement a revitalized PFM strategy that practically integrates these core principles into its PFM practices. Further, Government will bring to this House a Planning and Budgeting bill and an amendment to the Public Finance Act to place these cardinal PFM principles on a legal footing. 49. Mr. Speaker, the Public Private Partnership (PPP) framework provides a mechanism to employ private financing and expertise for delivering public goods and social services that would ordinarily be funded from the budget. The PF Government will collaborate with and encourage the private sector to participate in financing key public sector projects for the benefit of our people. The experience from the already implemented PPP projects will be used to strengthen project identification, development and implementation. We will also ensure that the implementation of PPP projects does not give rise to unsustainable contingent liabilities. There is a compelling need to guard against fraudulent schemes. 50. Mr. Speaker, effective formulation and evaluation of public policies depends on the availability of good quality and timely provision of statistics. In the past, inadequacies in the statistics have hampered well informed decision making. It has come to my attention that a number of organizations that are obliged to provide statistics have often not complied with the law. 51. Sir, we cannot allow this to continue and every organization operating in this country must avail Government with relevant information and statistics from time to time. Currently the Central Statistical Office is conducting an economic census. I implore the business community to cooperate with Government agencies collecting statistics as we all stand to benefit. 52. Mr. Speaker, I now present the budget for 2012 which focuses on promoting economic and social development through an appropriate balance between government expenditure, taxation and borrowing. 53. Mr. Speaker, the Government proposes to spend K27,698.3 billion or 26.5 percent of GDP projected at K104,462 billion in 2012. Of this amount, K19,976.0 billion or 72.1 percent will be financed from domestic revenues. K1,894.4 billion or 6.8 percent will be financed by grants from Co-operating Partners. The balance of K5,827.9 billion or 21.1 percent of total expenditure will be financed through domestic borrowing of K1,324.3 billion or 1.3 percent of GDP and gross external financing of K4,503.6 billion or 4.3 percent of GDP. 54. Sir, in line with the PF manifesto, the 2012 budget prioritises expenditures in the four core development areas of agriculture; education and skills development; health services; and local government and housing. In this regard, the budget allocations to these core programme areas have significantly been increased compared with the 2011 levels. 55. Mr. Speaker, let me now discuss policies and budget allocations. 56. Mr. Speaker, over the past three years, there has been an increase in agricultural output. However, the sector continues to face constraints such as low productivity, dependence on rain-fed agriculture, lack of appropriate and affordable breeding stock, low value addition, poor marketing and low investment. In addition, the competitiveness of the sector has been adversely affected by poor transport infrastructure, inadequate storage facilities and limited access to electricity. Further, Government policy has encouraged the growing of maize to the detriment of other crops. 57. Sir, these constraints mean that the benefits of improved agricultural output have often not reached the poorest rural households. As a result, the sector’s potential to significantly reduce poverty has not been tapped. 58. Mr. Speaker, in order to address these constraints, the Government will redesign the Farmer Input Support Programme, refocus market guarantees and differentiate extension service provision to support the production of crops which are appropriate to each agro-ecological zone. 59. Sir, alongside these reforms, action will be taken to improve crop productivity and production as well as soil and water management. The input provision and crop marketing systems will be streamlined and the sector’s competitiveness will be enhanced through infrastructure development and enhanced extension services. 60. Mr. Speaker, to the agriculture core programme, I have increased the allocation by 37.9 percent to K1,698.0 billion in 2012 from K1,231.6 billion in 2011. Of this amount, K500.0 billion is for the Farmer Input Support Programme and K300.0 billion for crop purchases for the strategic food reserve. The balance will cater for irrigation infrastructure, livestock development, fisheries and aquaculture development, and other programmes. 61. Mr. Speaker, educating our children is an important prerequisite for long term growth and reducing inequality. Currently, there is minimal early childhood education, poor quality primary and secondary education, dilapidated infrastructure and limited access to vocational and tertiary education. 62. Sir, we must, therefore, strive towards the attainment of high quality, universally accessible and development oriented education for all. In particular, greater emphasis will be placed on early childhood education as it is a critical requirement for the social and intellectual growth of our children. This will lay a firm foundation for our children to develop into productive and innovative citizens. 63. In this regard Mr. Speaker, I propose to increase the sector’s allocation by 26.7 percent to K4,850.5 billion in 2012. Out of this amount, K796.4 billion has been set aside for various infrastructure projects including construction of more than 2,000 additional classroom blocks. I have also provided K126.0 billion to upgrade Chalimbana and Palabana colleges into universities and commence works on a new university at Lubwa Mission. In addition, the Government will undertake a net recruitment of 5,000 teachers and update the curriculum to improve the quality and relevance of education to bridge the nation’s skills gap. 65. Mr. Speaker, many families across the country today are struggling to care for their sick. For these families, the hours are long, the responsibilities daunting, the demands unrelenting and costs significant. When they visit their nearest health centre, clinic or referral hospital, their anguish is only minimally diminished, as they face a health provision system that struggles to provide adequate medicines, beds and other basic health requirements. 66. Sir, we cannot allow this situation to continue. Provision of more resources to the health care system will therefore be an important starting point. Today, I am making a commitment to the Zambian people that the budgetary allocation to the health sector will progressively increase in line with the Abuja Protocol. 67. Mr. Speaker, in 2012, I have increased the allocation to the health function by 45.0 percent toK2,579.9 billion. Of this amount, K301.7 billion will be for drugs and medical supplies. With these resources, we will scale up the provision of essential drugs, and procurement of equipment and other medical supplies especially to the under-serviced rural areas. 68. Sir, a provision of K77.9 billion has been made for the net recruitment of 2,500 front line medical personnel while K389.3 billion has been provided for infrastructure and medical equipment. Key programmes under infrastructure development will include the completion of 8 district hospitals and the construction of 5 new district hospitals including the requisite housing for medical personnel. 69. Mr. Speaker, health care provision cannot only be judged in terms of resource allocation, but also by improving access and health outcomes. In order to increase access to health services, the Government will remove all financial barriers to accessing health services by abolishing all user fees for primary care services not only in rural but also in urban areas. 70. Mr. Speaker,Zambia’s communities, towns and cities are the places where our people live and work, raise their children, and want to retire in dignity and security. Each council is responsible for delivering services that are central to the everyday lives of our people. However, the functionality of the local governance system has been severely eroded thereby compromising local service delivery. 71. Sir, it is a priority of this Government to decentralize appropriate functions to councils over the medium term. The focus in 2012 will be to build capacity at local level in preparation for the phased devolution of functions from 2013. The Government will also restructure financial relations between the centre and the local level. This will ensure that these extra mandates devolved to the councils are adequately financed, in line with the principle of “finance follows function”. 72. Sir, in 2012, I have increased the grants to councils by more than 100 percent to K257.1 billion. This is to demonstrate the PF Government’s commitment to capacitate councils ahead of devolution. 73. Mr. Speaker, the provision of safe, potable drinking water and sanitation services in our communities requires our immediate attention. This will be addressed through the rehabilitation of more than 850, and construction of about 3,000 boreholes in rural areas. In urban areas, development and rehabilitation of water supply and sanitation infrastructure systems will be undertaken. In addition, the Government will facilitate the strengthening of the capacity of utility companies and other institutions in water and solid waste management. 76. Mr. Speaker, under the General Public Services function, the Government has made a provision of K8,304.8 billion or 29.9 percent of the budget. Out of this amount, I have allocatedK2, 091.9 billion to service domestic and external debt and K336.3 billion for payment of arrears to suppliers of goods and services. In addition, K257.1 billion has been provided for grants to local authorities, and K120.1 billion for the Constituency Development Fund. 77. Sir, other provisions include K200.0 billion for compensation and awards for payment of litigation cases ruled against the Government. A further K120.0 billion has been provided for contingency reserve meant to cater for unforeseen and unavoidable expenditures. The remainder of the resources will go towards regular Government operations. 78. Mr. Speaker, expenditure on the economic affairs function is projected to rise by 54.6 percent to K8,120.0 billion. Notable programmes include those in the agricultural sector, which I have already discussed, together with large investments in the energy and roads sectors. In the energy sector, I have allocated K864.0 billion as Government’s contribution to equity in the construction of the Kafue Gorge Lower power project while K437.1 billion is for the Rural Electrification Fund. 79. Sir, for the road sector, I have provided K4,481.0 billion, the bulk of which will go towards ongoing projects. Out of this amount, K101.0 billion has been allocated for feasibility studies and design for new projects including Leopards Hill to Chiawa, Kasempa-Kaoma, Kawambwa-Mporokoso and Luwingu-Kaputa roads. In addition, K60.0 billion has been provided for preparatory works on the Lusaka Ring-Road project. Other road projects that will be undertaken in 2012 include Mongu-Kalabo, Nyimba-Sinda, Nakonde-Mbala, Kalulushi-Lufwanyama, Kabompo-Chavuma, Bottom road and Mumbwa-Landless corner. 80. Mr. Speaker, with regard to the tourism sector, I have provided K21.1 billion for tourism marketing and promotion and K15.0 billion to recapitalize Zambia Wildlife Authority. 81. Sir, I have also provided K30.0 billion to facilitate the initial works of establishing the new provincial headquarters for Muchinga Province and the relocation of the provincial capital for Southern Province to Choma. 82. Mr. Speaker, the Government intends to spend K1,017.4 billion or 3.7 percent of the budget on the Public Order and Safety function. Of this amount, K55.8 billion has been set aside for infrastructure development projects which include police housing units, police stations and forensic laboratories. In order to improve policing, K30.0 billion has been provided for the Zambia Police modernization programme and K16.7 billion for the net recruitment of 1,000 police officers. Further, an allocation of K50.0 billion has been made to continue with the programme of court construction and rehabilitation. 83. Mr. Speaker, I have allocated K352.9 billion to this function. Of this amount, K150 billion has been provided as Government contribution to the water and sanitation sector, representing an increase of 26.1 percent from the 2011 provision. The funds will be used to improve access to clean and safe drinking water in rural and peri-urban areas. 84. Mr. Speaker, a total of K655.6 billion has been allocated for social protection programmes. Of this amount, K474.2 billion has been provided for grants to the Public Service Pension Fund. In addition, K90.0 billion has been provided for various social safety nets which include the Public Welfare Assistance Scheme, food security packs and social cash transfers. 85. Mr. Speaker, in the economic objectives and policies that I have just outlined, it is very clear that the PF Government has a very ambitious plan to transform the Zambian economy. To do so, we need to carefully balance the demands of our citizens for lower taxes against the demands for higher spending, especially on poverty reducing programmes. This means that we must rebalance the burden of taxation, providing tax relief for those who have borne a disproportionate burden in the past while at the same time generate more resources from those areas of the economy that have benefited most from our strong macroeconomic performance. 86. Sir, under these circumstances, the Government expects to raise resources of K27,698.3 billion or 26.5 percent of GDP to support the 2012 Budget. Domestic revenues will constitute 19.1 percent of GDP while grant receipts from our cooperating partners will be 1.8 percent. The balance of 5.6 percent of GDP will be total borrowing out of which 1.3 percent of GDP will come from domestic borrowing and the balance of 4.3 percent of GDP will be external financing. 88. Mr. Speaker, during the run up to the election, the PF Government made a promise to the people ofZambia that it will streamline the tax system, lower tax rates and promote tax compliance. One of the commitments we made was to put more money in people’s pockets. I wish to assure this august House that we remain as committed to this cause as we were then. 90. Sir, the PAYE restructuring increases disposable incomes of the workforce by about K1.0 trillion which can only be salutary for the economy. 91. Mr. Speaker, the Government believes that growth should be largely private sector driven. However, the cost of borrowing for investment has inhibited most of the private sector, particularly our local entrepreneurs, from engaging in gainful ventures. In order to compliment the efforts that we have already undertaken to reduce the cost of money, I propose to abolish the 40 percent upper corporate tax rate for banks. With this measure, banks will now be required to pay the standard corporate tax rate of 35 percent. This will help to make banks more liquid, a desirable objective to facilitate low cost borrowing by enterprises. 92. Sir, this measure will result in a revenue loss of K65.0 billion and I expect the banks to pass on the benefit of this measure to the borrowers by lowering lending rates further. 93. Mr. Speaker, agriculture is at the centre of our pro-poor development agenda. Sustaining the gains which have been registered in this sector over the recent years requires that we continue to increase capital formation and investment in this sector. I, therefore, propose to reduce the corporate income tax that is applicable to the agricultural sector from 15 to 10 percent. The proposed reduction is meant to increase investment and thereby raise productivity, output and incomes of our farmers. This measure will make available K10.6 billion for re-investment into the farming sector. 94. Mr. Speaker, in order to compensate for the revenue loss arising from the above measures, I propose to increase the mineral royalty rate to 6 percent from 3 percent and 5 percent for base and precious metals, respectively. I also propose to separate income arising from hedging activities from core mining activities for income tax purposes. 95. Sir, I expect to raise K981.0 billion from these two measures. 96. Mr. Speaker, in order to align the treatment of commission payments to non-residents with that of other income streams such as royalties, interest and management or consultancy fees, I propose that commission payments made to non-residents be deemed to have a source in Zambia and therefore taxable at 15 percent. This measure will result in a revenue gain of K24.0 billion. 97. Sir, all the above measures will come into effect on 1st April, 2012. 98. Mr. Speaker, in 2009, the Government introduced a policy to include copper and cobalt ores and concentrates on the VAT deferment scheme. This was done to promote the utilization of excess smelting capacity following the decline in the country’s mineral production. However, with the increase in local production of copper and cobalt ores, it is no longer justifiable to retain these products on the scheme. I, therefore, propose to remove copper and cobalt ores and concentrates from the Import VAT Deferment Scheme. This measure will generate an extra K6.9 billion. 99. Sir, this VAT measure will come into effect on 1st January, 2012. 100. Mr. Speaker, in 2006, Government introduced an export duty of 15 percent on the export of copper and cobalt concentrates in order to encourage local value addition and create employment. This policy is discriminatory as it does not apply to other minerals thereby creating an uneven playing field. In the spirit of making this tax less burdensome and its application non-discriminatory, I propose to reduce export duty to 10 percent but also extend it to all unprocessed or semi-processed mineral ores. The revenue gain as a result of this measure is K70 billion. 101. Sir, in 2007, the Government removed customs duty on light passenger aircraft to promote tourism. I propose to extend this concession to cover helicopters and micro-lites. This measure will have a minimal revenue loss. 102. Mr. Speaker, I propose to increase the duty rebate threshold on travelers’ effects from US $500 to US $1,000. This will benefit travelers coming with accompanied personal effects from outside of the country. This measure will have a minimal revenue impact. 103. Sir, all the above Customs and Excise measures will take effect on 1st January, 2012. 105. Sir, I also propose to amend the Customs and Excise, Income Tax and the Value Added Tax Acts to update and strengthen provisions and remove ambiguities in certain sections of these pieces of legislation. 106. Mr. Speaker, the process of granting additional incentives under Section 58 of the ZDA Act provides discretion and lacks transparency, thereby creating opportunities for corruption. I, therefore, propose to remove Section 58 in the ZDA Act in order to prevent leakages in the tax system and strengthen the quest for enhanced revenue mobilization. 107. Mr. Speaker, the Patriotic Front won the 2011 Elections because it listened to the needs of the People at all levels. Now that we are in Government, we have not, and will never, distance ourselves from our people. His Excellency the President and his entire Cabinet have committed themselves to work tirelessly so that Government responds, in practical ways, to ensure that the economy is put on a path of rapid growth and that its benefits are widely shared by every Zambian. 108. Sir, we are not a Government that basks in the empty glory of statistical euphoria, but one that seeks a transformational shift in society to make it more just and equitable. In this regard Mr. Speaker, allow me to briefly summarize what this first budget of the PF Government means to ordinary Zambians. 109. Mr. Speaker, to the unemployed youth who feels this nation has little use for his energies, it means more opportunities for appropriate skills training and thus greater prospects for income-earning activities through which he can positively contribute to the development of his nation. To the peasant farmer who only seeks to feed his family through his toil in the field, it means the provision of extension services and farm inputs that are tailored to the agricultural conditions of his area and to improved access to markets for his produce. To the promising pupil who learns in a makeshift classroom with no desk and not a single text book, it means an improved learning environment which can better equip her for a bright and productive future. To the grandmother who is looking after her deceased daughter’s sick orphan, it means free access to health care so she can buy the food they need. To the enterprising businesswoman who lacks the funds to embark on her great ideas, it means access to cheaper capital that can be the catalyst to make her dream a reality. To the hard pressed resident in a compound whose home and property is threatened with floods each rainy season and whose environment is strewn with refuse, it means the laying of the foundation for an empowered local council which can provide the basic local services he and his family deserve. To the hardworking copper miner, the committed artisan and the industrious businessman, it means more money in their pockets from which they can raise their living standards and those of their families. To civil servants, it means an environment where professionalism is reinvigorated and impropriety repudiated. 110. Mr. Speaker, to all taxpayers, the PF Government promises to manage public finances in a fully accountable and transparent manner so that all abuse of taxpayers’ money is identified and dealt with and all scope for corrupt practices eliminated. 111. Finally Mr. Speaker, allow me to enter a passionate plea to all Zambians to resolutely and unequivocally rally behind our President, the custodian of our interest, especially those of the disadvantaged segments of our great country, to putZambia’s development on a sustainable trajectory. 112. Mr. Speaker, I beg to move.